Geelong have been too efficient for St Kilda over the four quarters. They won the disposal count by 79, inside 50's by 13 and have converted 46 per cent of their inside 50's into scores. Joel Selwood has amassed 41 disposals, the most he has collected since round 8 2011. Aaron Black and Darcy Lang have been hugely influential with 8 score involvements each. Since the 1st quarter, St Kilda has created one goal from 38 defensive 50 chains. Whilst, the Cats have launched 2.2.14 from 30 defensive 50 chains. George Horlin Smith has four score involvements for the quarter, whilst Mitch Duncan has gamehighs in inside 50's (6) and metres gained (520). Geelong have been extremely efficient going inside 50 this quarter. 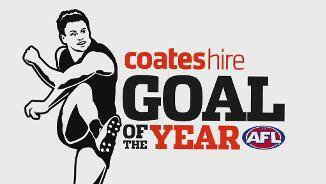 They have created 8 inside 50's and have launched a goal from 50 per cent of these entries. Patrick Dangerfield has been the beneficiary with two goals. St Kilda has improved in the two areas that let them down in the first half. They have applied 9 more tackles than Geelong and their kicking in the forward half is 76 per cent. Saints InterchangeNick Riewoldt off due to an injury. The Cats have erased 30 point deficits in the last two weeks and have continued their second half form today. They have won the disposal count by 58 and inside 50's by 9 since half time, converting these 45 per cent of these entries into a score. The Cats have started the quarter as they finished the third, launching an inside 50 from both their first two intercepts and creating 1.1.7 from this source. The Cats won the contested possession count by 16, inside 50's by 6 and created 3 more intercepts in that quarter. However, they failed to generate a goal from 14 defensive half chains due to their poor goal kicking efficiency of 40 per cent. Joel Selwood has six score involvements for the quarter. Their has been a clear difference between the two sides ball use in this quarter. St Kilda's disposal efficiency is 33 per cent higher in their forward half and as a result they have created 4 goals to 3. St Kilda has dominated around the ground from stoppages and have been clinical. They have won 4 more clearances from this source and converted these opportunities into 3 more goals. 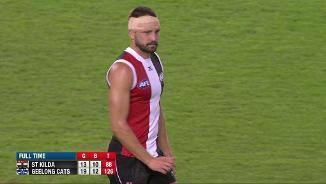 Saints InterchangeJarryn Geary off due to the blood rule. The Cats are winning the centre clearances by 3 so far and have created a score from 38 per cent of these clearances. This is well above their average of 15.2 per cent in the first four games. St Kilda have been clinical from midfield chains, launching seven goals from this source. On the other hand, the Cats have created just two goals from 28 midfield chains. 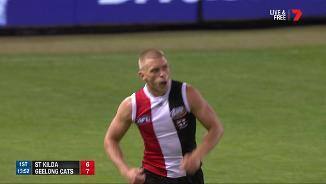 Since the beginning of the 2nd quarter, St Kilda has won the disposal count by 52, contested possession count by 16 and have created a goal from 31 per cent of inside 50's. 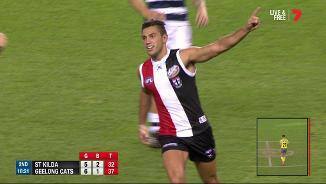 St Kilda has launched a score from 50 per cent of their attacking midfield intercepts so far. Seb Ross has 19 disposals and a gamehigh 7 score involvements, whilst Nick Riewoldt had 6 score involvements and a game-high 324 metres gained. In this quarter, the Saints have created a mark inside 50 from 5 of their 14 forward 50 targets. This is largely due to their high disposal efficiency of 79 per cent in the attacking midfield. Geelong are ranked number one in the competition for creating goals from their defensive 50. Today, they have already launched three goals from this zone. 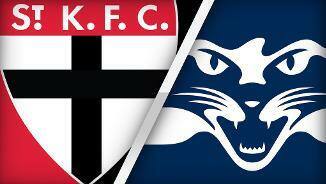 St Kilda is winning the contested possession count 31 to 20 and their kicking efficiency is 15 per cent greater than Geelong. As a result, they have created 2 goals to 1 from turnover chains. St Kilda has been a far more cohesive defensive unit in this quarter. They have intercepted five of Geelong's nine inside 50's so far, restricting the Cats to just one goal. Jack Steven has been extremely influential, amassing a gamehigh 18 disposals, 9 contested possessions, 4 clearances and 3 score involvements. St Kilda is relying on intercepts in their midfield to generate scores. They have created 13 intercepts in this zone, generating 3.2.20. 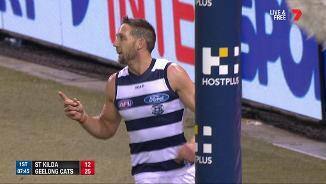 Whilst, Geelong has been more clinical from their defensive 50 creating 2 goals from 12 defensive 50 intercepts. Geelong has applied more pressure to start the game with 25 tackles to 17 (with 6 to Jack Steele). Joel Selwood has been pivotal in these entries with 200 metres gained, 3 clearances and 3 score involvements. Whilst, Zach Tuohy has aided the Cats defensive transition with 3 intercepts and disposals at 100 per cent kicking efficiency. In the first quarter, St Kilda led the inside 50's by 4 and clearances by 3, creating a goal from 25 per cent of entries. However, Geelong were too efficient launching a goal from 50 per cent of their inside 50's, four of which came from turnovers. Seb Ross and Maverick Weller have been pivotal in this opening quarter for St Kilda. Weller has had 168 metres gained and four inside 50's, whilst Ross has a gamehigh 12 disposals and 4 score involvements. The Saints have won 6 of the last 8 clearances, led by Jack Steven with three. They have also created six inside 50's form this stoppages, but have launched just one goal from this source. The Cats are ranked number one in the competition for creating a goal per inside 50 this season. From their first eight inside 50's, they have launched five goals; two of which were launched from centre clearances. Geelong are ranked third in the competition for generating scores from their centre clearances. They have already won 3 centre bounce clearances and launched 1.1.7 from this source. St Kilda has had 7 of the last 9 inside 50's. This is as a result of their disposal efficiency in the forward half, which is 23 per cent greater than Geelong. Geelong has had the ball in their forward half 60 per cent of the time. However, St Kilda has created eight intercept chains across the ground and converted these chains into 2.0.12. In the first four rounds, St Kilda has averaged 26 minutes and 22 seconds in the forward 50, which is the highest of any side. However, they rank just 9th and 5th for time in forward 50 in the 3rd and 4th quarters. The Cats have generated a score from 22 per cent of their defensive half clearances this season, which is ranked No.1 in the competition. Welcome to Etihad Stadium for the St Kilda v Geelong Cats Round 5 clash. GEELONG remains undefeated after five rounds, having produced a withering eight-goal final term to overcome St Kilda by 38 points at Etihad Stadium. The margin was misleading as St Kilda was brave and matched the Cats for most of the game but Geelong, again led by Joel Selwood and Patrick Dangerfield, lifted in the final quarter to break the Saints' spirit, winning 19.12 (126) to 13.10 (88). Skipper Selwood, as is typical, led the charge, winning 15 of his 43 disposals and kicking a goal in the third quarter when the Saints threatened to gain the ascendancy. He picked up five free kicks for the game but, despite the howls of the Saints crowd, only one was debatable as he put his head in holes that wild dogs would step back from and bark. 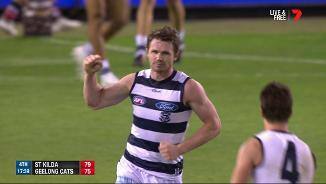 Dangerfield was more subdued than his midfield mate throughout the first three quarters but lifted in the final term, booting two of the Cats' eight goals and finishing with 31 touches. While the star duo was prominent again, it was a brilliant piece of play from the unsung George Horlin-Smith that pushed the balance Geelong's way when scores were level midway through the last quarter. 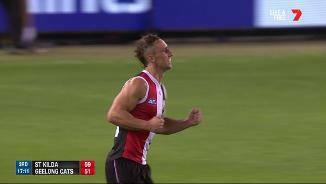 Soon after St Kilda's Jade Gresham fumbled a mark inside 50, Horlin-Smith won a tough ball and handballed to Jordan Murdoch, who shoved it back his way. 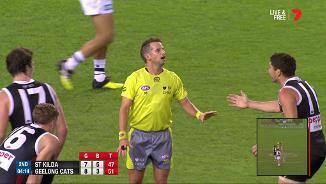 After gathering the slightly misdirected handball, 'The Hyphen' moved it on to Harry Taylor who kicked it long to Dangerfield in space. Dangerfield strolled into goal to put his side a goal up and from then on, the Cats kicked the next five goals to run out 38-point winners. The final term may have been one-sided but the first half was as entertaining as they come, with a couple of firsts including Harry Taylor's first goal and Mark Blicavs' first free kick for the season, having given away nine in the first four rounds. 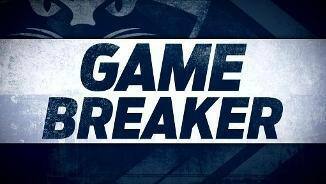 Aaron Black was also very good in his first game with Geelong and kicked a goal with his first kick for the Cats. Neither side used the ball efficiently as they would have liked but the pace of the game increased the risk attached to each disposal. The margin was tight – just two points at half-time – but the Saints on-ballers were very good, with Jack Steele laying eight tackles in a half and Jack Steven showing his importance with 22 touches. Turnovers defined the start of the second half, with the Saints scoring the first two goals third term as the Cats coughed up the ball when they overused it by hand. Steven was electric and he stretched the lead beyond two goals when he pumped his legs inside 50 and kicked a long goal. At that stage, the Saints appeared likely to beat Geelong on the outside, running quicker when they had possession and closing down space when they didn't. 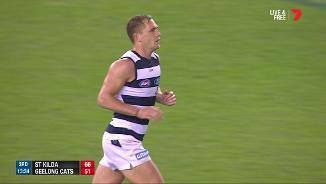 But Selwood rallied his side and received good support from Mitch Duncan, Horlin-Smith and Blicavs, who not only ran Billy Longer off his legs but matched up on Steven at stoppages in an attempt to quell his influence. Zach Tuohy was good in Geelong's defence while Saints backman Dylan Roberton was equally influential for his side. 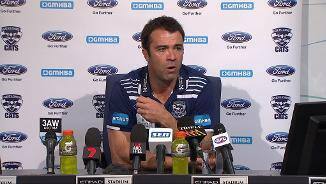 Geelong coach Chris Scott said the Cats were outplayed for long periods but were close enough at three-quarter time to come home hard. "We were good enough to hang in when they had the momentum and then ran out the game really well," Scott said. It was the fourth successive week Geelong has run over the top of the opposition in the final quarter, outscoring its opponents 191 to 38 in the last quarter from rounds 2-5. "We shouldn't be relying on that and we are certainly not going to talk ourselves up as fitter than any other team but the numbers do suggest that if we are close enough in the last quarter we are a chance," Scott said. "At the very least, it should give our guys confidence." 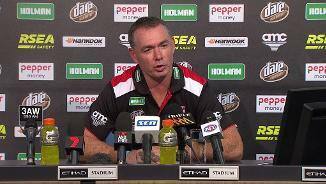 St Kilda coach Alan Richardson was disappointed the Saints' midfield could not match Geelong once the intensity lifted in the final quarter. 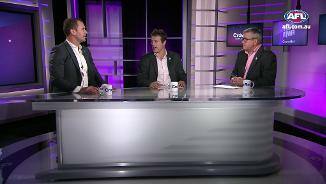 "One group of midfielders, really led by a couple of their great players, put their hand up to be outstanding, in terms of their want to get the ball forward and drive their team," Richardson said. "We weren’t able to match it. On the outside we got outworked." Billy Longer had a rough day, copping a hip knock and then laboured after Mark Blicavs took a big contested mark over him. Nick Riewoldt played out the final quarter in discomfort after rolling his right ankle in a marking contest. Andrew Mackie suffered a corked thigh while Tom Hawkins copped a knock to the hip, but both played out the game without appearing hampered. St Kilda has the incentive to keep Hawthorn close to the bottom of the ladder in Launceston on Saturday, given the Saints hold the Hawks' first-round draft pick in 2017. Geelong will want to keep the heat on Collingwood next Sunday at the MCG. It's a good time to get the Magpies as they come off a five-day break after Anzac Day.